1. Never forget to include on the box and on the packing list/agreement the complete name, updated address and contact details of both parties (sender & consignee). 2. Write illegibly on the packing list/agreement and on your packages the complete name, updated address and contact details of both parties (sender & consignee) so that it’ll be easier for us and for the forwarder to read all the important details. 3. All fragile/glass items should be wrap in a piece of cloth or bubble wrap to avoid breakage. 4. Do not put all fragile/glasses items under a heavy item to avoid any damage. 5. To avoid spill of items such as coffee, sugar or any other powdered items; securely cover it with an additional packing tape. 6. Liquid items should be on an upright position and should be covered with a packing tape. 7. Customers should be aware that all banned items are not allowed in our Balikbayan package. 8. Declare ALL the content of your box. Write/Enumerate it on the packing list. 9. If you are sending items with different recipients in (1) box put the names on each item to avoid misunderstandings. 10. Seal the label (top & bottom) of the box with the proper/strong packing tape. 11. If there will be sudden changes of address and/or contact details of your consignee please inform us ASAP (as soon as possible) so we can change it before the proper schedule of delivery. 12. Inform your relatives that you have an upcoming package(s) and give them their box number(s). Please be noted that the Box number(s) is important so it’ll be easier for our forwarder to check the status of your package if your consignee calls them for delivery update. 13. Advise your consignee to prepare any valid identification to be presented upon delivery of their package. NO PACKING LIST/AGREEMENT (INCOMPLETE DETAILS) WILL BE DELIVERED LATE. PROPER PACKAGING OF BALIKBAYAN BOX. Please see photos for the proper packaging of your box. From now on (JUNE 2015) we require the usage of our Company's Packing Tape especially during Peak Season. Kindly inform us for order/s. 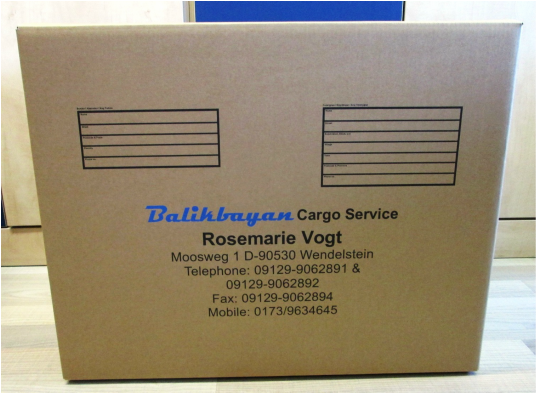 We can deliver it upon pick-up of your box or we can send it through UPS together with your request for empty boxes.